Skunkbush Sumac (Rhus Trilobata) other name : polecat bush, stinking sumac, ill-scented sumac, quailbush, squawbush, squawberry, basketbush, lemonade sumac, three-lobed sumac, three-leaved sumac, lemita. Skunkbush (scientific name Rhus trilobata) is a low-growing, bushy shrub belonging to the sumac genus. Also known as sourberry or three-leaf sumac, skunkbush sumac grows up to a height of anything between 2 feet and 6 feet. This shrub is found growing in clumps in rocky terrains all through different section of the eastern United States. The leaves of this shrub are trifoliate (hence the common name three-leaf sumac), which appear on an inch-long stalk. The leaflets of skunkbush appear directly from the stems (sessile) and are covered with very fine, short hairs (pubescence), when they are young. Compared to the lateral leaflets, the terminal leaflet is significantly large, measuring about 1 inch to 2 inches long and roughly two-thirds of its length in width. The leaflets are complete and narrow at the base. The leaflets are acute with eight to ten teeth with notched margins at the apex. Skunkbush produces small flowers having a greenish-yellow hue. The flowers blossom in April prior to the emergence of the leaves. The flowers grow on stalks, are spiked and appear in ament-like clusters. Before the flowers open, they look like unexpanded catkin. The petals, sepals and stamens all appear in fives, while the pistil comprises one-ovuled ovary, having three small styles. The fruit of skunkbush is a little red-hued drupe, having the size of a pea. The fruits are swathed with compact, white-hued pubescence. In fact, the fruits appear in clusters, each containing about one dozen drupes, on small stalks measuring roughly an inch in length. Each fruit encloses a solitary compressed seed. When crushed, the leaves of Rhus trilobata emit a very potent scent. Some describe this scent as bitter or medicinal. However, skunkbush sumac is sufficiently unpleasant and this is the reason why the herb is called skunkbush. When new, the leaves have a green hue, but they change to orange and brown during the fall. When new, the twigs of skunkbush are fluffy and they become smooth as they grow. The flowers of skunkbush appear on small catkins or short shoots and usually come in white or pale yellow hues. The fruits of this plant are edible. Skunkbush fruits are small, hairy and somewhat sticky berries, which have a sour flavour, but have an aroma akin to that of limes. The fruit encloses tannic acid and gallic acid, which are responsible for its acidity. These flowers are pollinated by animals, while the seeds are scattered by animals that consume the berries. In addition to propagation by seeds, skunkbush also reproduces vegetatively, by sending up sprouts many meters away from the parent plant, thereby giving rise to groves. Traditionally, various parts of skunkbush have been employed for therapeutic as well as other purposes. The bark of this herb has been chewed and also brewed to prepare a drink for treating symptoms related to cold. 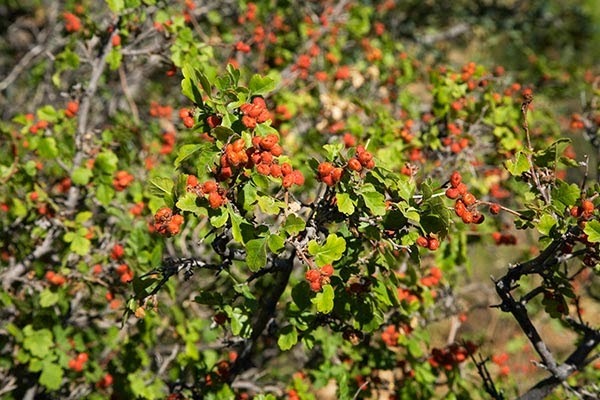 The berries are consumed for curing gastrointestinal (GI) disorders, while the leaves as well as the roots of skunkbush are boiled and then eaten to treat several different problems. Some people also smoke the leaves, something akin to tobacco. 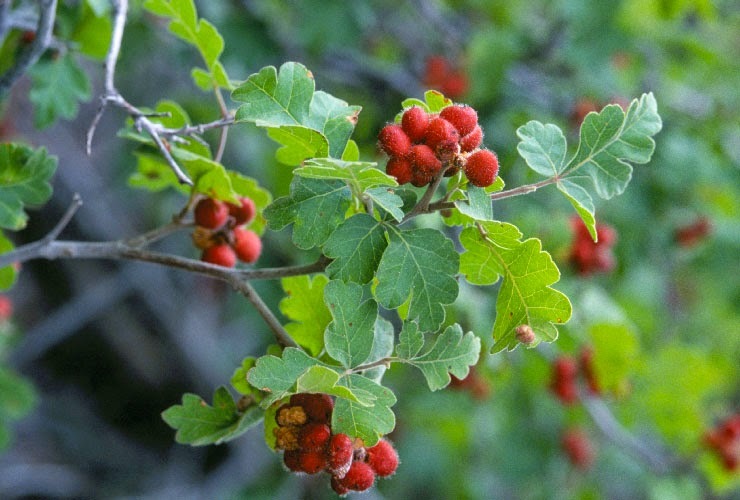 Since long, people have been eating the skunkbush fruit or berry for treating stomach problems as well as grippe. In addition, the berries or fruit are chewed to alleviate toothache and also used in the form of a mouthwash. The berries are dried up and pulverized into a powder, which is dusted on smallpox pustules. The leaves of this herb are used to prepare an infusion, which has been traditionally used for treating head colds. On the other hand, a decoction made from the skunkbush leaves is drunk for inducing impotency - a means of natural contraception. The leaves are also used to make a poultice that has been employed for treating itches. They are also used in the form of a gastrointestinal and diuretic aids. In both instances, the leaves are boiled in water and the resultant solution is drunk when cold. People have traditionally used the skunkbush roots in the form of a deodorant. Some people also consume the roots to treat tuberculosis. Occasionally, skunkbush sumac plants are grown to prevent soil erosion and also for landscaping. This plant is also used to reclaim barren land that has been stripped of vegetation owing to random mining. There was a time when the supple branches of this plant were in high demand and useful. They were twisted for making rugs and baskets. 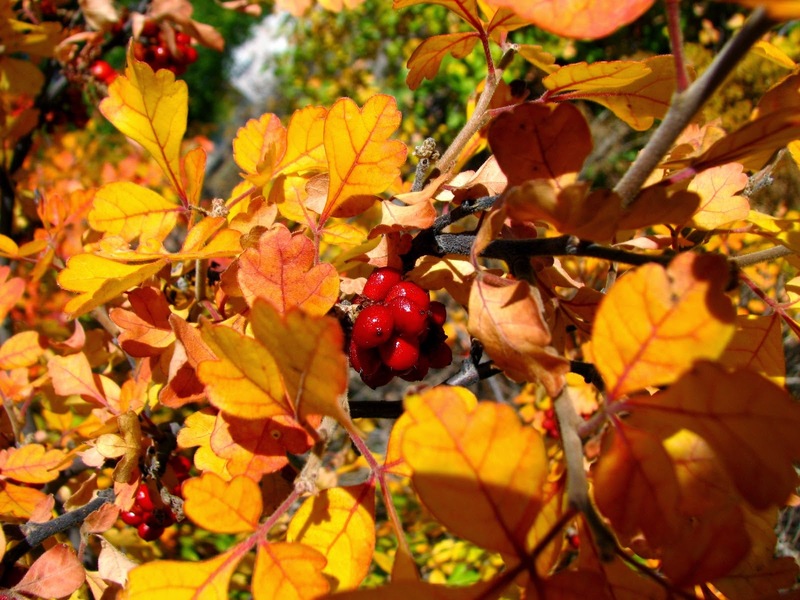 The native communities in North America used the ripened berries to prepare a tea or lemonade-like drink. In addition, the fruit was also used for treating a variety of aliments and health conditions. Earlier, the natives of North America employed skunkbush therapeutically. In fact, several Indian tribes in North America actually valued Rhus trilobata, particularly for the plant’s astringent properties. Hence, the plant was used to treat a number of health conditions. In modern herbalism, people seldom use skunkbush for remedial purpose, if they ever do. However, the plant is potentially toxic and, hence, skunkbush sumac ought to be used with caution and if possible only under the direction of a competent medical practitioner. The fruit is used to prepare a decoction, which has been traditionally used in the form of a wash to put off hair falling. The leaves of skunkbush possess astringent, emetic, diuretic and haemostatic properties. A decoction prepared from the leaves of the plant is used internally to induce impotency - a means of natural contraception. The bark of the low-growing shrub was used to prepare an infusion, which has been traditionally employed in the form of a douche following childbirth. Some people also chewed the bark and swallowed its juice to treat sore gums as well as colds. A decoction prepared from the bark of the skunkbush root has been used internally to assist in trouble-free release of the placenta. As mentioned earlier, the roots of this plant have been employed in the form of a deodorant. People also rubbed the buds of the plant on their body as a therapeutic perfume and deodorant. Rhus trilobata leaves are loaded with tannin. The skunkbush sumac leaves are collected when they fall on their own in autumn and used to make a brown or black dye. Alternatively, the leaves of this plant can also be used in the form of a mordant. Even the skunkbush fruits are used in the form of a mordant. The twigs of this plant yield a yellow dye, while one can obtain a black dye when the twigs are combined with pine gum. The skunkbush sumac leaves as well as bark of the plant yield a reddish-brown dye. The fruit is used to produce a pink-tan colorant. Even the ashes of skunkbush plants are employed in the form of a mordant to attach dyes. The seeds of Rhus trilobata yield oil, which achieves a consistency like tallow when left to stand for a while. This oil can then be employed to make candles. Candles made from the oil extracted from Rhus trilobata seeds burn excellently, but they produce a pungent smoke. Traditionally, the roots of skunkbush have been employed to make perfumes as well as deodorants. Even the buds of the plants have been used in the form of a therapeutic perfume and deodorant. The aborigines rubbed the leaves on the body to repel insects and snakes. However, when using the leaves for this purpose, one needs to be cautious to ensure that they do not cause toxicity. The branches of skunkbush are slender, but really tough. Their bark is removed and then the branches are divided into numerous strands, which are employed for making baskets. There was a time when locals used the leaves and the bark of Rhus trilobata for tanning leather. Mixed with tobacco, the leaves of skunkbush are smoked as cigars.